I'm taking a posting break until next Tuesday or Wednesday, so there will be no Saturday Spotlight today. However, I did quickly want to share some exciting news - at least it is exciting news for me. One of my blog posts was featured on One Pretty Thing this week for their Kids' Craft Roundup. I've mentioned this site before on a Website Wednesday post. Take a moment and check out all the other kids' craft ideas (including my exciting debut) at One Pretty Thing. I finally clothed Molly Monkey. This means that my eleventh craft till Christmas is officially finished! Feast your eyes on this beauty! **I haven't heard from my Molly Monkey partner, Kristin, for a while. She has been really busy with birthdays, adoption stuff and the endless to-do list of a mom, but I'll let you know when she gets her Molly done as well. I think that an organized supply closet fosters creativity in adults as well as kids, so whether you have kids or you are a crafter/sewer yourself, I highly recommend finding a way to organize your own supply area. Perhaps you have a plethora of plastic food containers that need to repurposed and given new life. Now back to our egg-carton creations...both girls spent about an hour cutting, coloring and gluing, and they came up with the most unique creations I've seen in a long time. I think you'll agree. Check out (from left to right) the three balloons with a caterpillar on the ground, a baby snowgirl, a big sister snowgirl and various foam sticker creations. 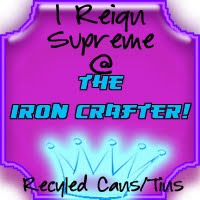 Craft on! About two weeks ago I posted about Dolly Donations (click to read Feb. 9 post) started by Sarah Hanson. I was so inspired by Sarah that I wanted to make a few dolls to donate. Sarah provides a free, easy peasy pattern to make donating a doll relatively simple for even the most novice sewers - like me. So this Saturday I'm shining the spotlight on these great gals who used their Friday night, their supplies and their talent to put together dolls for children in an orphanage in Haiti. If you are inspired by them (and who wouldn't be), you can go to my previous post about Dolly Donations and follow the links to Sarah's blog, pattern and shipping info. Also, we had such a good time together that we will be doing this again. if you are in the area and interested in joining us, please let me know. 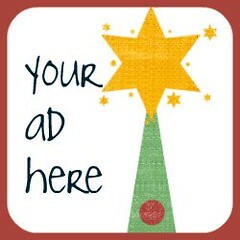 You can post a comment that you're interested or e-mail me. Be inspired and . . .
**All the pictures in this post were taken by Lana of LG Imagery. Check out her amazing work at her website by clicking on the blue words. Also, see more of her pics of this night by visiting the twelve crafts flickr group. Although I don't have much time to surf crafting blogs and sites, every once in a while I do stumble across one that I'm really inspired by. One Pretty Thing compiles so many amazing craft links and blogs into one place. Just one minute spent on this site and your brain can be racing with twenty or more crafty ideas. It is because of One Pretty Thing that I became acquainted with Obsessively Stitching and her flair for creating fun projects. (Picture to the right is from her blog.) This week at Obsessively Stitching is "tent week". Check out her project ideas and . . . Okay, so there are no medals given out for amateur sewing accomplishments but having watched the pairs figuring skating competition last night I'm in the medal mood. I'm a realist. If there happened to be a medal competition for amateur sewing, I probably wouldn't win by the judges' standards. But I am celebrating success tonight after much "failure" with my little Molly Monkey. She is not completely finished, so I would probably lose marks for that - maybe a few tenths. (I have no idea what I'm talking about.) As you can see, she is still naked due to a little double fold bias tape drought in my supply box. (I don't have any double fold bias tape, and to be honest, I don't even really know what that is. A quick visit to a craft/hobby store in the near future will take care of that though.) In spite of Molly's nakedness, I'm still excited that I've come this far! I'm already starting on her friend as I wait to get the supplies I need to finish the first one. Two little girls means two little monkeys. So, I've started a flickr group. If you look through a craft flickr group, you'll be amazed at the creative things people make. There are some super talented people out there! But . . . the thing about these flickr groups is that people always post their successes - their best and brightest projects. No one every posts pictures of their flubs, their flops . . . their (gasp) "failures". We all "fail" at something sometime. And these so-called failures should be celebrated not shunned - relegated to the scrap pile or the junk heap of life. After all, if you fail right, you learn something every time. You learn to clip corners before you turn something right side out. You learn to adjust the thread tension on your sewing machine. You learn to put right sides together. You learn how to use fusible interfacing. You learn rotary cutter technique. You learn . . .
And let's face it . . . isn't there something in you that feels like success is even sweeter after failure? So . . . please post your success - your best and your brightest. But next time you flub, flop or "fail", snap a picture and post it here (or click on the flickr badge to the left of this post) in celebration of a new thing tried and a lesson learned. This Saturday I'm shining my spotlight on Luke. Luke is incredibly talented with all things wood. Truth be told, his entire family is oozing with talent - photography, crafting, sewing, woodworking, graphic design, sign making. You name it. They can make. I don't really need to say much about Luke. These pictures from his blog pretty much speak for themselves. You can check out more of his work by clicking on one of the links below. And you can find his e-mail on his blogs if you are interested in Luke making a custom item for you, or you can click on the final link to find items listed for sale. Luke was recently featured in a local Omaha magazine. Check it out at on pages 30 & 31. 1.) Lost is not a show that you start watching the second show of the last season. 2.) It is not a show about people like me who recently started sewing. 3.) After watching one episode of Lost, sewing directions like, "Bind one edge with coordinating bias tape. Overlock or use pinking shears on other edge, then turn it down 1/2 inch and press. Edgestitch to form a tube for elastic, leaving two inch opening," actually seem way more understandable. I mean understanding directions like these is like child's play compared to understanding that show. 4.) Why did that one guy with the ponytail torture that other guy with the curly hair? And why didn't he pass the test? And why does the gal with the long hair seem to be running from the law in one scene and then walking through a jungle in the next? And why is the guy from Party of Five there? (I used to love that show by the way.) Anyone? I did discover one thing that the show Lost and sewing have in common - they are both terribly addicting in spite of the fact that they are both terribly confusing and frustrating. I'm still working on Molly Monkey. I'm confused. I'm frustrated. I'm addicted. Yep, it's a lot like watching Lost. I'm not sure if I'll tune in next week, but I'm pretty sure I'll still be working on Molly Monkey next week. Here's picture of her cute little addicting face. **My Molly Monkey partner, Kristin, is having a lot of success on her little monkey. She hit one rough spot turning those tiny little ears, and she e-mailed the Monkey's maker, Larissa, who gave her a hint (Brilliant idea Kristin!). I can't wait to see pictures of her Molly Monkey! RST why are you taunting me? This pretty much sums up my night. You probably can't see what I'm talking about from this picture, but I ended up sewing the sleeve/arm combo pieces of Molly Monkey WST . . . uhm, that's wrong (very wrong) sides together. Not only did I sew the sleeve/arm combo pieces WST, but first I sewed the sleeve and arm pieces for each side of the sleeve/arm combo pieces WST as well. It was a bloomin' mess, and I wasn't the wiser until I started turning the freshly sewn pieces. So . . . after ripping out every little stitch on both sleeve/arm combo pieces and then the stitches on each individual sleeve and arm piece, I decided to pack it in for the night. I didn't even begin to sew these pieces back together RST . . . I think I will be banning that three letter combo from my vocabulary after I finish Molly Monkey. It seemed like I should give up while I was very, very behind. So I end reluctantly with my usual send off . . .
free pattern . . . If you've been reading along on my little blog, you may remember a post I wrote following the earthquake in Haiti. (Click here for a refresher.) The problems in Haiti are still beyond our comprehension, but I've heard amazing stories about how people like you and me are finding ways to help - even from afar. An average-sized church in our area collected upwards of $30,000 for Haiti relief. An elementary school put together 60 hygiene kits for people who need basic supplies like toothbrushes and soap. Families from our community donated supplies for babies - blankets, cloth diapers, sleepers, etc. Today, I'm inspired by Sarah Hanson at Dolly Donations who has come up with an amazingly simple way to make a difference in the lives of orphans. 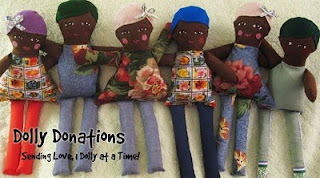 Check out her blog - Dolly Donations. (Picture from her blog.) 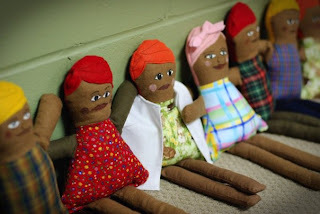 Sarah is asking volunteers to craft very simple dolls from a super simple (and free) pattern she provides (that can basically be made entirely from scrap fabric) so that these dolls may be sent to Haitian orphans impacted by the earthquake. Here's our chance to help in a simple but tangible way. If you have your grandma's sewing machine in the basement, drag it out and sew a doll. If you are working on a project, take a break and sew a doll. If you have never sewn anything in your life but your friend has a sewing machine, stop by her/his (hey, guys can sew too) house and sew a doll. If you just started sewing a year ago; you are trying to make all your kids' Christmas presents before next December; and you are writing a blog about it, sew a doll. (Hmmm . . . that last one seems vaguely familiar.) Basically, what I'm trying to say is . . . sew a doll. Of course, true to form I can't let cutting out a few pieces actually be as easy as it sounds. You see there are these crazy little abbreviations sewers like to use to drive non-sewers like me slowly insane. One of those abbreviations is RST. My oldest daughter has mastered the alphabet and knows just about as much about sewing as me, so I asked her what RST means. She came up with Rainbows, Snow and Tea Parties. Hmmm . . . interesting guess, but I thought I would get a second opinion from my youngest daughter who has recently made it about five letters into the Alphabet Song. She came up with Rinnah Have That. She actually got two out of the three letters correct, but I think that was just a good guess because I was holding a book that she wanted at the time. So . . . it turns out RST means Right Sides Together. That would have been helpful to keep in mind before I cut the first few pieces out. Having said that . . . can you guess what is wrong with this picture? Yes, that's right, I did not cut these out right sides together. So, one of those Molly Monkey back pieces will find its way into the scrap pile to live another day. In spite of this very minor oops, I'm glad to have Molly Monkey underway. It's not too late you join us. Kristin and I would love to have another person join the Molly Monkey journey! let us eat cake . . . Tomorrow my baby turns two . . . I guess that makes her offically no longer my baby. As I think back over the past two years, I can't believe how fast it has gone. It's been such a blessing to get to know her over these past two years. So far I've learned that she is determined, passionate, loving, curious, not easily distracted, very active and so much more. I look forward to getting to know even more about her in the years to come. I've mentioned that I call her monkey because, often, as she climbs on the counters, over the kitchen table and under chairs, it's easy to mistake her for a monkey. However, lately her animal of choice is a puppy as she crawls around on the floor under foot panting and barking. So . . . for our little puppy's birthday, I decided to craft a doghouse cake. I'm thankful for the inspiration Jennifer at JK Country Bakery provided (see previous post). And although Jennifer is clearly more crafty in the cake creation department, I did try my hand at cake decorating this weekend in celebration of my spunky puppy's second birthday. I have to admit that it was a whole lot of fun to figure out how to make this thing completely edible. A whole different kind of craft. So whether you have a special birthday to celebrate, an anniversary coming up or you're just hungry for some cake, think of something fun to craft out of cake and go for it. saturday spotlight - let's eat cake! I'm a big believer in the fact that crafting takes many forms . . . whether it's cute clothes for a dancing chicken, a beautifully reupholstered chair or a cleverly decorated cake. That's why this week I'm shining the spotlight on my friend Jennifer Probst who owns JK Country Bakery with her husband, Keith. Jennifer is an incredibly talented baker. Everything she makes tastes d-e-licious! I'm a super big fan of her monster bars, apple pie and pumpkin cookies. I'm not ashamed to say that I could eat an entire plate of her monster bars in one day. (Okay, I'm a little ashamed to say that, but they are THAT good!) Jennifer made this pirate ship cake, and I think it looks almost too good to eat. Although . . . I bet the little boy whose birthday it was for had no trouble digging into it. Here are some of her other cute creations. I'm using Jennifer's inspirational cakes to craft my own cake-creation this weekend for my youngest daughter's second birthday. What will you be inspired to create? I've been thinking about trying my hand a some clothing for my girls. At first, I was thinking it would be fun (you know, fun as in torture) to make them each a spring/Easter dress. Then I started looking at the Molly Monkey pattern (see previous post). I realized if I can't even follow this pattern without googling every other word, I'm pretty sure sewing children's clothing is off limits . . . for now at least. Then I came across these directions for sewing a child's skirt. This looks like an easy peasy skirt . . . something even I could make . . . maybe . . . well, probably not, but it's worth a shot. I'm not including this in my list of twelve crafts till Christmas because it's more of a spring skirt. Hopefully, I can make two between now and Easter. This will be a fun (fun as in actually fun) little gift to include in their Easter baskets. I can get too focused on craft/sewing gifts for girls. However, here's a shout out to all of you with little boys in your life . . . check out this sweet little tie pattern/project from Molly at purlbee.com. (Picture from purlbee.com.) She says that you don't even need a sewing machine to make this tie. Woo hoo! You could include this in his Easter basket instead of the skirt. Of course, if you wanted to include the skirt, I'm not going to stop you. :) This is just another option. So enjoy two more free patterns . . . fun weekend projects for those of you who will be stuck inside because of the weather. are you learning to sew? then you will love the tv show "lost". I hear from my friends who are Lostites (fans of the show Lost) that the final season started last night. Having never actually seen that show, I can only assume from the title that it's a show about people like me who are learning to sew using patterns like Molly Monkey. I'll have to tune in for next week's show which I can only hope will be an episode explaining what in the world "whipstitching" is while the characters decipher these directions, "Bind one edge with coordinating bias tape. Overlock or use pinking shears on the other edge. Edgestitch to form a tube." We would love to have someone else join us. Kristin is far more knowledgeable in the sewing department. I'm definitely the weak-link in our long-distance sewing partnership. In fact, I already had to ask her what wool felt is. Oh Kristin, you are a saint. and i present . 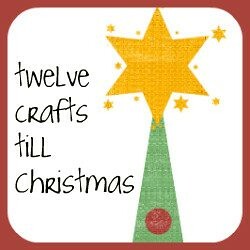 . . the eleventh craft till christmas! 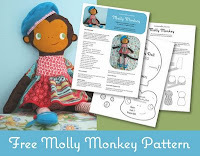 I'm slightly nervous but excited to try my hand at this Molly Monkey pattern for February's craft of the month. As is my custom, I made my decision without actually thinking it through completely or reading the pattern instructions. Once I printed out the pattern and took a glance at the instructions, I started getting cold feet. There are lots of abbreviations and a few words I will be looking up. I know they publish English to Spanish translation books. Someone should make an English to sewing translation book because sometimes I sense that people who sew aren't talking my language. I had the opportunity to spend about three months in China some time ago, and I honestly felt like I understood Cantonese better than I understand sewing-speak. I would love to have one of you join me in this project. Please! I will definitely need a fellow traveler on this bumpy journey into the world of Molly Monkey making. E-mail me at lizbeth694@aol.com if you are interested. Here are the links to Molly Monkey at mmmcrafts and Mikey Monkey. Another free pattern . . . woo hoo! Molly is a full pattern, but Mikey is simply Larissa's variation on the Molly pattern to make it more boy-friendly. Take a look and let me know if you will be sewing up a Molly or Mikey this month.